Operation Twist a Primer for QE3? One does not need to be an economist to see that the Fed has already been “twisting” its holdings of Treasury securities. It used to be that over 50% of Treasuries held by the Fed had a maturity of less than a year. That portion has already shrunk dramatically. Operation Twist is going to focus on the purple shading, replacing many of these securities with longer-dated ones. Differently said, Operation Twist really is nothing new, but an extension and expansion of policies in place since 2008. Indeed, Bernanke has a playbook, hiding in plain sight: in his 2002 speech that earned Bernanke his nickname as “Helicopter Ben”, he laid out his plan when faced with the threat of deflation. Whereas his predecessor Paul Volcker took years to convince the markets that the Fed was serious about fighting inflation, Bernanke appears to be relentless in trying to convince the markets that deflation is not going to happen in his back yard. But why not simply print more money as the economy has slowed (engage in “QE3”)? 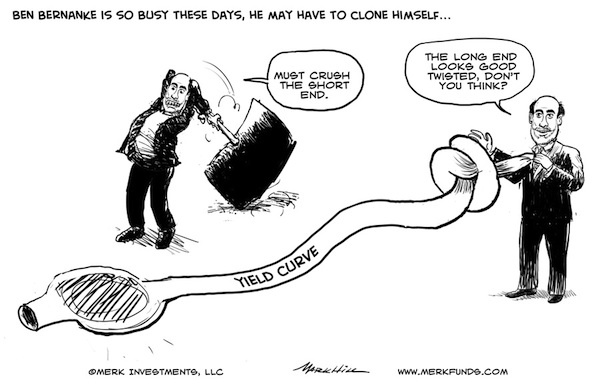 First crushing the short end of the yield curve by committing to keep interest rates low until the middle of 2013. Then lower long-term interest rates by initiating �Operation Twist�, the selling of short-term securities by the Fed in the billions, then reinvesting the proceeds in long-term securities. Add to that overall gloomy economic data, and conditions may be ripe for inflation expectations, as priced into bond price differential with and without inflation protection, to drop. 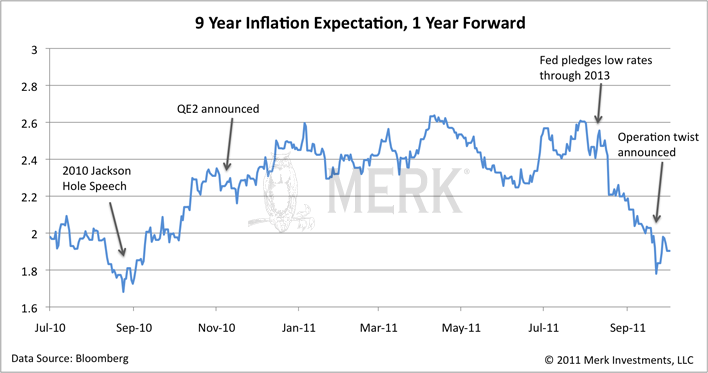 Sure enough, that is exactly what has been playing out; the chart below depicts inflation expectations over a nine year period, beginning one year from today (referred to as “forward” inflation expectations, as it filters out inflation expectations over the short-term; this approach helps adjust for inflation shocks that may be presumed to be transitory in nature). �First, the Fed should try to preserve a buffer zone�, i.e. an implicit or explicit inflation target between 1 and 3 percent. �I personally prefer�for the Fed to begin announcing explicit ceilings for yields on longer-maturity Treasury debt (say, bonds maturing within the next two years)." �The Fed might next consider attempting to influence directly the yields on privately issued securities�the Fed to offer fixed-term loans to banks at low or zero interest, with a wide range of private assets (including, among others, corporate bonds, commercial paper, bank loans, and mortgages) deemed eligible as collateral. " Enough said. While the markets have been “disappointed”, when push comes to shove, Bernanke has stuck to his playbook. He has paved the way for QE3. We have argued that there may not be such a thing as a safe asset anymore, and that investors may want to take a diversified approach to something as mundane as cash. Investors may want to actively manage their U.S. dollar risk, be that for their domestic or international investments. After all, investors may want to position their portfolios to take the risk that Bernanke will do what he has said into account. We manage the Merk Hard Currency Fund, the Merk Asian Currency Fund, the Merk Absolute Return Currency Fund, as well as the Merk Currency Enhanced U.S. Equity Fund. Please join us for our Quarter 3 Merk Webinar on Thursday, October, 20th at 4:00pm ET / 1:00pm PT. To learn more about the Funds, please visit www.merkfunds.com. Please sign up to our newsletter to stay in the loop as this discussion evolves. The Merk Currency Enhanced U.S. Equity Fund (MUSFX) seeks to generate total returns that exceed that of the S&P 500 Index. By employing a currency overlay, the Merk Currency Enhanced U.S. Equity Fund actively manages U.S. dollar and other currency risk while concurrently providing investment exposure to the S&P 500. Since the Funds primarily invest in foreign currencies, changes in currency exchange rates affect the value of what the Funds own and the price of the Funds' shares. Investing in foreign instruments bears a greater risk than investing in domestic instruments for reasons such as volatility of currency exchange rates and, in some cases, limited geographic focus, political and economic instability, emerging market risk, and relatively illiquid markets. The Funds are subject to interest rate risk, which is the risk that debt securities in the Funds' portfolio will decline in value because of increases in market interest rates. The Funds may also invest in derivative securities, such as for- ward contracts, which can be volatile and involve various types and degrees of risk. If the U.S. dollar fluctuates in value against currencies the Funds are exposed to, your investment may also fluctuate in value. The Merk Currency Enhanced U.S. Equity Fund may invest in exchange traded funds ("ETFs"). Like stocks, ETFs are subject to fluctuations in market value, may trade at prices above or below net asset value and are subject to direct, as well as indirect fees and expenses. As a non-diversified fund, the Merk Hard Currency Fund will be subject to more investment risk and potential for volatility than a diversified fund because its portfolio may, at times, focus on a limited number of issuers. For a more complete discussion of these and other Fund risks please refer to the Funds' prospectuses. 1Generally speaking, a central banker may be considered a hawk if his or her monetary policy stance is perceived to focus more on inflation and less on expansionary policies. 2Generally speaking, a central banker may be considered a dove if his or her monetary policy stance is perceived to focus more on stimulating employment and economic growth and less on inflation.